Archaeology provides an ideal avenue for examining long-term processes and interrelationships between human behavior and environmental stability, variation, and change. The American Southwest is particularly well suited for such 'deep-time' investigations because of its comprehensive archaeological record, rich ethnographic and historical data on its peoples, and unmatched reconstructions of multiple environmental variables across a broad range of spatial and temporal scales. 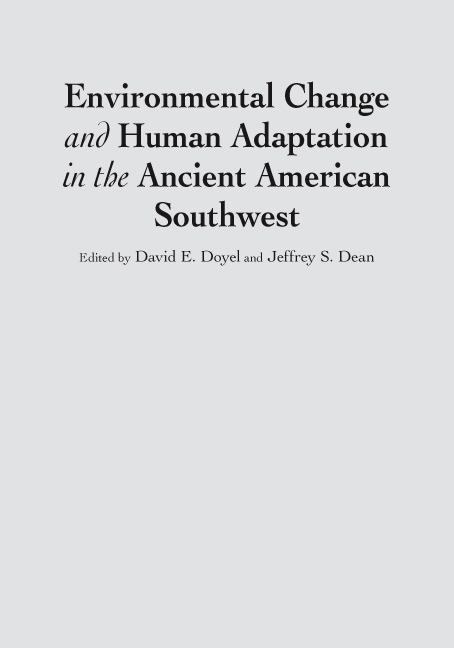 This volume contains a varied and instructive set of studies of human behavioral adaptation to environmental change in the ancient Southwest. It makes significant contributions to southwestern prehistory, settlement pattern studies, agriculture, behavioral ecology, paleo-environmental reconstruction, and statistical and computer-aided modeling. The mix of case studies and syntheses covers the Colorado Plateau, Sonoran Desert, Mogollon Highlands, and Rio Grande Valley and summarizes the work of some of the leading researchers in the region. David E. Doyel owns and operates Estrella Cultural Research and is adjunct faculty in anthropology at Arizona State University. Jeffrey S. Dean is professor of dendrochronology (Laboratory of Tree-Ring Research) and professor of anthropology at the University of Arizona, and curator of archaeology for the Arizona State Museum.